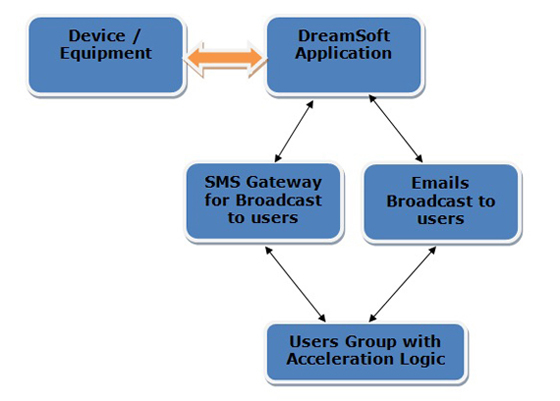 DreamSoft specializes into Device Interface based SMS and Email Applications where our application will be connected via device followed protocol to the device or equipments and as per the defined Alarm or Interrupt configurations, application at desired point can send SMS / Email to a group of users. SMS / Email is sent from application in Manual and Auto Modes. Voice Alarm can also get generated and we have designed Application to convert Text into Voice. There is a Alarm acknowledge module as well where users will be able to do the acknowledgement. Also features like acceleration are provided for multiple level of users. This is a very intelligent system for any critical or non critical industrial processes or devices / equipments. Mobile User Config: - This will allow user to define Mobile Numbers along with Mobile User Name. Group Master: - Admin can create different groups and map mobile user into this group to which SMS has to be sent. Alarm Configuration: - This will allow user to define different alarm message which is to be transmitted when an alarm event occurs. User can also define type of Alarm i.e Critical or Non Critical even it can define Group for Level 1 / Level 2 / Level 3 to which SMS has to be accelerated. Configuration Setting: - This option will allow user to define communication port at which GPRS modem is to be communicated. User can also define SMS String how it is to be sent to User. Manual SMS:- This option will have an option of Sending Manual SMS incase Admin want to update all user incase of any maintenance work on so that SMS Generated has to be ignored or even test system by sending manual SMS. Manual Acknowledge: - This option will allow user to Manual acknowledge any SMS which was triggered falsely so that it is not accelerated further to next level. SMS Log: - This option will allow user to check SMS log sent by the System. Printable option for the same is also available. Application User: - This option allows Administrator to create multiple Application user who can access configuration utility. There will be 2 groups defined i.e. Administrator having access to all menus, Operator who can send Manual SMS, view SMS Log, Acknowledge SMS but will not have an access to configuration utility. Pending SMS Deletion: - This option will allow Admin to Delete any False SMS Generate by the system. Application will continuously poll all defined Sensors and monitor status of each sensor. On Change of alarm condition application will generate an SMS for system.